In the past two weeks alone, Viktor “Isildur1” Blom has reportedly lost over $1.7 million. Being Victor Blom must be stressful. The young phenomenon, who first appeared on the nosebleed stakes poker scene a few years back, caught the attention of many pros with his wildly aggressive style. At first, every high stakes pro on the planet wanted to play him, most to quickly discover that behind the guise of recklessness is an astute poker mind. However, the man they call Isildur is still a highly volatile player; one who can win or lose millions on the flip of a dime. Unfortunately for him, the past two weeks have proven nothing short of disastrous. Last week, Blom took a $1.4 million hit. His loss was spread out across 62 sessions and over 6,800 hands, good for an average loss of over $200 per hand. Much of those losses came while playing a $400/$800 NLHE six-max game with top pros Doug “WCGRider” Polk, “MalACEsia,” “Call_911,” and “Denoking.” Blom ended the session down approximately $300k. Polk would end up playing Blom again later in the week, this time taking him for $388k. The biggest pot of the session was nearly worth half-a-million dollars. Yes, that’s real money. Shockingly, Isildur would not be crowned the day’s “Biggest Loser.” That dubious honor went to MalACEsia, who lost an astounding $858k. Things haven’t fared much better this week for the young Swede. Over the course of 12 hours, he lost an additional $329,000, some of it to Alex “IReadYrSoul” Millar. The two squared off at $400/$800 NLHE, and while Blom opened up a massive $600k lead, he could not hold it, dumping it all back and then some. On one of the pivotal hands of the match, Blom raised and Millar three-bet to $6,700. Blom made the call and the two saw a flop of 2♦6♣7♠. Millar checked the flop. Blom, as he usually does when it’s checked to him, bet. Millar quickly raised to $28,800 and Blom made the call. The turn, which brought the 4♠ saw Millar bet another $28.8k. Once again Blom called. The river was a blank, the 10♣. Millar, wanting Isildur to believe that he either missed his draw or held a marginal hand, checked his option. Isildur pounced, moving all-in for his remaining $97.7k. Millar made the call and exposed 7♦6♦, good for a flopped top two and the massive $325k pot. 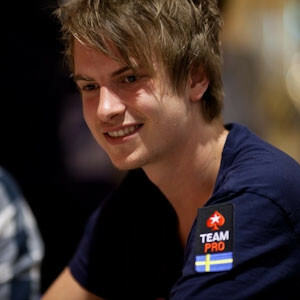 Will fortunes reverse for the young man from Sweden with a seemingly infinite bankroll? Time will tell. But one thing is for certain: this isn’t the last we’ve heard from Victor “Isildur1” Blom.